Hello again, folks. Here we go with another round of step by steps. Owing to time restrictions (Christmas is my busiest time of year) and the complexity of the latest painting I’m only going to do one step, instead of two at a time. This time I’ll go more into the thought process behind the image, focussing more on the story behind the picture, rather than the technique. Of course the two go pretty much hand in hand, since the selection of colours, and the performance of light are as important as the drawing that begins the process. I use light and colour to convey mood. The Grey Ones are a sorry looking pack. They’re neither Nightmare, nor Human, and they cannot find a sanctuary in either world. 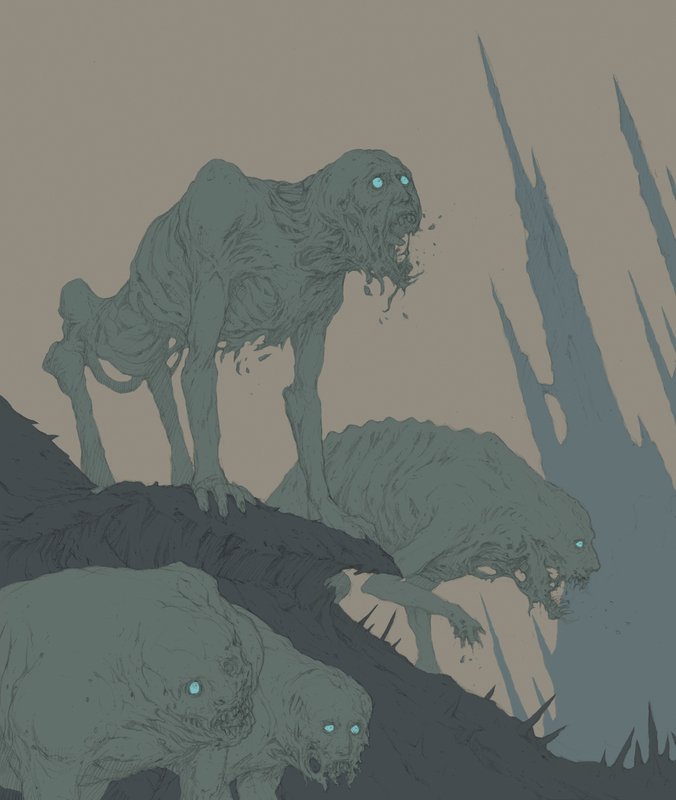 As their name suggests I pick the colour grey for the creatures’ skin tone. I also want to depict their environment as inhospitable as possible, so it’s as drab and dreary as the Grey Ones themselves. Later on I’m going to try and make the ground into something alien and inorganic – this is the world beyond sleep. I’ve picked a light blue for their eyes, as I want the them to stand out. The BloodMare was a tireless, brutal killer and I removed its eyes because I didn’t want the viewer to identify with the creature, the Grey Ones are a little different and have doleful eyes which we can connect to. Sure, they’re monsters, but they were also once people like us. (At the drawing stage I made sure not to give the Grey Ones frowning expressions; I wanted them to to seem forlorn and hopeless, offset with grizzly, ragged jaws). More on this when I get time.